Processes up to 3x35mm or 2x120 films at any one time. The Nova FP range of daylight thermostatically controlled film processors offer a superbly simple way of maintaining, with accuracy, the high temperatures required for colour C41 or E6 processing ensuring predictable colour and reliable results, but, critically, with minimal hassle. Made in the UK, and designed around the series of Paterson tanks, they offer a superb simplified alternative to the Jobo rotary processors. Also ideal for B&W processing. Chemicals are held in 3 x 1 litre graduated bottles which slot into the processor and are maintained at the consistant temperature. As when using a Paterson tank in the usual manner, processing agitation is by lifting the tank and inverting (up-ending) it. The processor can be adapted to enable you to process 5x4 film with the use of a Combiplan Sheet Film processing tank (optional) which drops into the cutout used by the roll film tank. 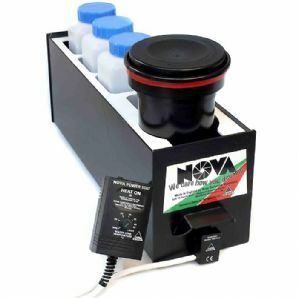 Supplied complete with 3 bottles, Paterson film tank and temperature controller. Film spools / spirals are not included.